Have you noticed your Facebook engagement has been on a downward spiral lately? There’s no need to panic. Although the recent changes to the Facebook algorithm have many marketers sweating, the update isn’t as scary as it seems. The short of it? Facebook is asking brands to rethink how they earn likes, comments and shares on their posts. 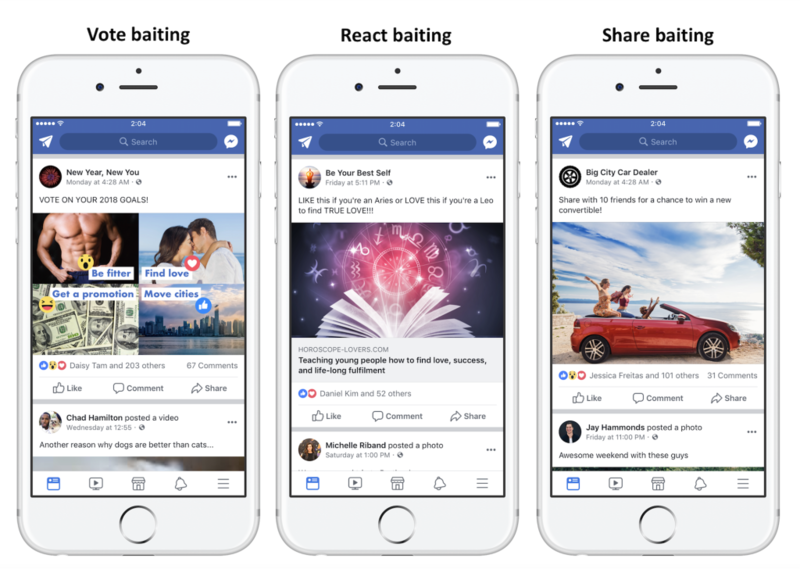 For example, Facebook is explicitly fighting against engagement bait and spammy tactics which they see as undercutting their algorithm. The takeaway here is that what might have worked brilliantly for brands in the past might not fly today. And that’s exactly why brands need an explicit Facebook engagement strategy if they still want that sweet, sweet organic reach. You don’t need to abandon your current Facebook page or start over from scratch, either. Instead, you just need to consider ways to set your posts up for greater engagement. Below we’ve outlined 10 strategies to do exactly that. This might seem a bit backward but it speaks to the importance of timing your posts to perfection. By posting when your followers are most active, you instantly increase the likelihood of getting likes and comments. And yes, there are data-driven best times to post on social media which can clue you in on what your posting calendar should look like. The key here is to not just post at random and expect engagement. With the help of the chart below and analyzing your past posts, you can zero in on a schedule that makes sense. 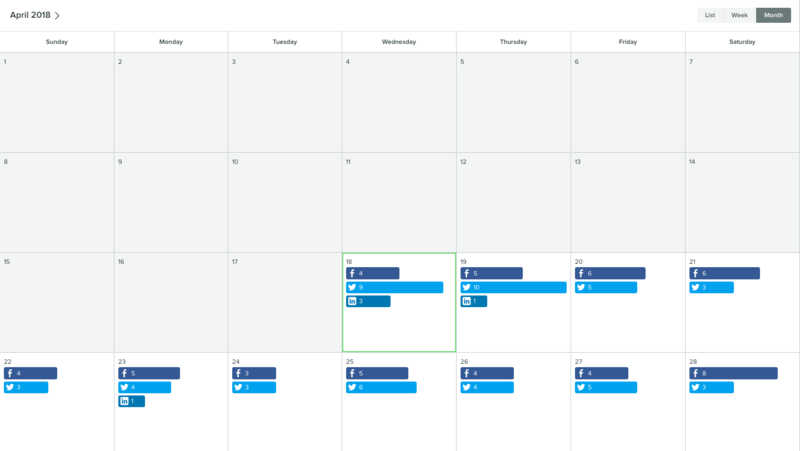 We recommend using a Facebook scheduling tool to plan your social media calendar days or weeks in advance. It’ll keep you from forgetting to post and give you the flexibility to test different posting times. Many brands make the mistake of putting themselves in a box when it comes to their content. Let’s say you’re running a Facebook page for your sandwich shop. Should you exclusively post content related to sandwiches? For starters, there’s only so much that can really be said on a day-to-day basis about your brand or product. As soon as your content starts to feel repetitive or stale, your audience will tune out. Here’s some food for thought: your Facebook content isn’t all about you. It’s about your fans. They might like you, but that doesn’t mean they only want to hear about you all day long. Once you start to embed that idea into your strategy, increasing Facebook engagement becomes much more realistic. And if you’re struggling to find ideas for fresh content, you can start by asking yourself a few questions. Are There Any Relevant Real-World Events to Piggyback? Pulling from pop culture and current events is a smart move if done tastefully. Check out how Hubspot put out an awesome video on Marvel’s marketing strategy to coincide with the release of The Avengers: Infinity War. Found Any Fascinating Facts or Stats Related to Your Fans Lately? Infographics and shocking statistics are prime for discussion and debate, both of which are huge pieces of Facebook engagement. Activity in the comment sections spells good news to the updated algorithm. Have You Made Your Fans Laugh Lately? Like it or not, Facebook has become a hotbed for memes and humorous content. Although humor not might be the perfect fit for every brand, funny content typically performs well and is a lighthearted way to diversify your posts. It might be tempting to simply talk about yourself, but that’s not going to drive much engagement. Strive to stick to the golden rule of rule of content curation that says only 20% of what you post should be self-promotional. Besides, filling your feed with a variety of content will always keep your followers looking forward to what’s next. 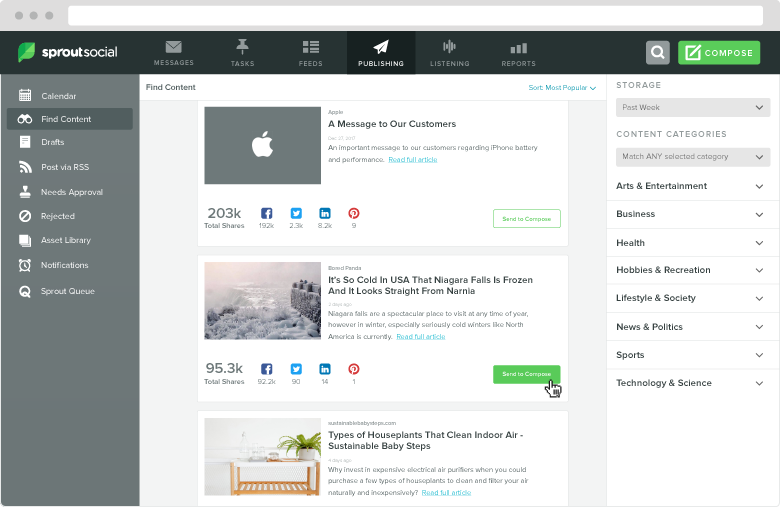 Oh, and if you want to have instant access to fresh pieces your audience will love, tools such as content suggestions from Sprout can do the digging so you don’t have to. Sometimes the key to increasing Facebook engagement is to look inward. Let’s say you have a post that knocks it out of the park. 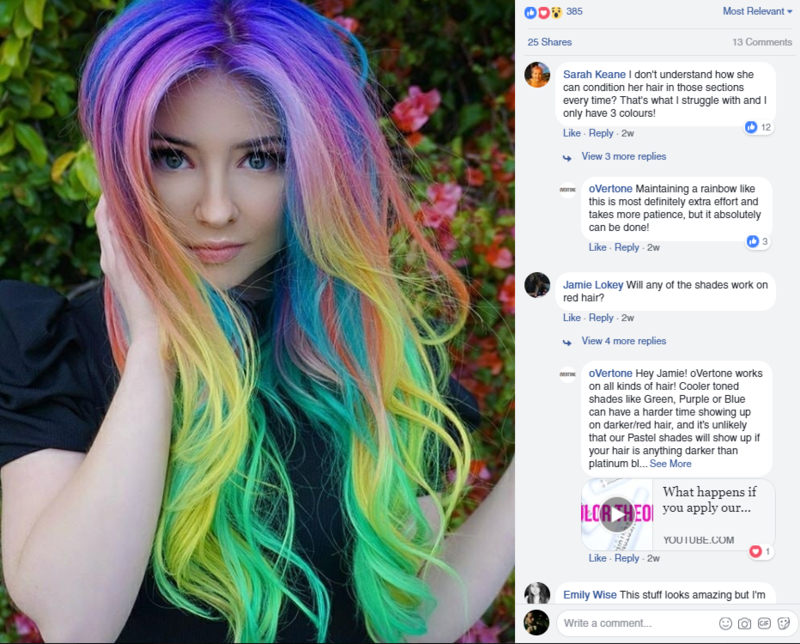 Tons of likes and shares, and plenty of love in the comment section. Rather than treat that post as an anomaly, you should instead take steps to recreate the same social magic again. Maybe it was an unexpected meme. Perhaps it was an epic case study. Either way, you should have a pulse on your top-performing content instead of playing guessing games. Again, your fans’ activity is key to understand what to post. To better break down that activity, take a close look at your Facebook analytics to see firsthand what’s receiving the most reach. The answer might very well surprise you. Visual content totally kills it on Facebook–plain and simple. Photos make up the overwhelming majority of content on the platform, signaling that people would much rather engage with a visual than a link or wall of text. So if you want to improve Facebook engagement, get visual. However, the type of images you post make a massive difference in terms of performance. Many budding businesses make the mistake of relying on stock photos or images pulled from elsewhere rather than creating their own content. Instead, brands should strive to show the personality behind their business. There’s a reason why photos “in the wild” are so popular from big brands, as are stories from employees. After all, it’s the social network, not the stock photo network. Improving your Facebook page engagement isn’t a “one and done” affair. If someone takes the time to comment on your content, you should return the favor yourself. People overwhelmingly want to interact with brands, which is the reason why so many businesses that reply to comments score more interactions. And by the way: replies have become an expectation in today’s social space. Given that people respect a social response within four hours of commenting, timely responses are a game-changer. If nothing else, taking the time to reply to fans shows that you’re listening to them. This is a good look from a branding perspective and also encourages more interaction among fans in the future. If you don’t have time to respond to each and every inbound message you can create a Facebook Chatbot to do so for you! Likes, shares and comments aren’t just vanity metrics. These pieces of engagement serve as valuable data points for the type of content that people actually want to see. That’s why you should translate what’s performing well on Facebook to your own content on-site. After all, your business’ blog is about so much more than SEO. Sure, you might be wary of the constant listicles and borderline clickbaity stuff you see on Facebook, but the metrics don’t lie. Tailoring your blog content for Facebook doesn’t mean compromising quality or resorting to clickbait, though. It’s all in the presentation. Titles that pique people’s interest. Setting up your readers for a punchline. By crafting your posts this way, you automatically set them up for more Facebook engagement. As noted, Facebook is trying to lead brands away from excessive “TAG YOUR FRIENDS!” or “SMASH THAT LIKE BUTTON IF YOU…” posts. That said, including a call to action within your posts is totally fair game. Doing so provides your fans with a voice and reminds them that they want to hear from you. 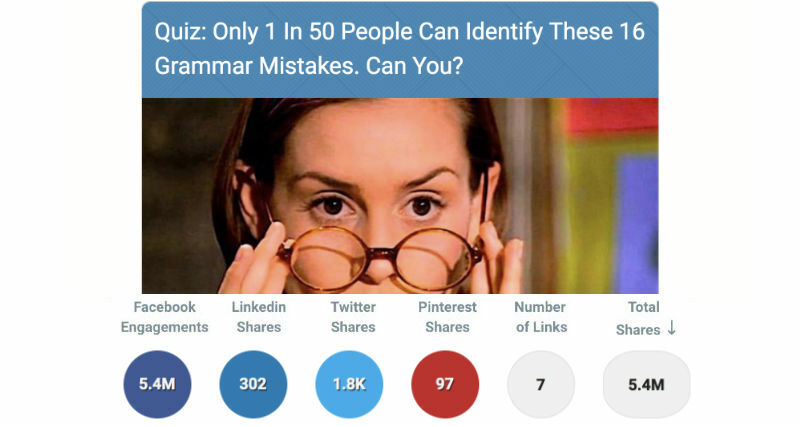 A quick and easy way to do so is to simply tack a question onto your posts. You could also consider coming up with a series of content where you regularly pick your followers’ brains. Encouraging comments, debate and discussion are a-okay, just don’t beg for them. Facebook isn’t shy about how much they love video content on their platform. As part of the recent algorithm update, Facebook explicitly notes how well native video performs. They encourage brands to post videos to drive discussion among their followers. This means simply copy-and-pasting a link to your recent YouTube video as a post isn’t going to cut it. Instead, brands should upload directly to Facebook’s platform if possible. Whether it’s animations, commercials or jumping on Facebook Live, regularly uploading video content on Facebook regularly is a smart move supported by the platform itself. When in doubt, keep your posts as brief as possible. Remember: there’s a good chance you’re dealing with scrollers and mobile users. Treating your posts like novels creates more opportunities for readers to lose interest and likewise miss your CTA. Seriously, though. A sentence is all you need to grab someone’s attention and guide them to click through. And this all serves as a reminder that winning interactions on Facebook doesn’t have to be complicated. When Facebook announced they’d be showing users fewer posts from brands, marketers were understandably upset. Lower organic reach means brands will likely have to spend more money on Facebook Ads to get their content in front of their target audience. But there’s a way around that—employee advocacy. Instead of solely relying on your brand page to share your latest content, why not ask your employees to do some of the heavy lifting? 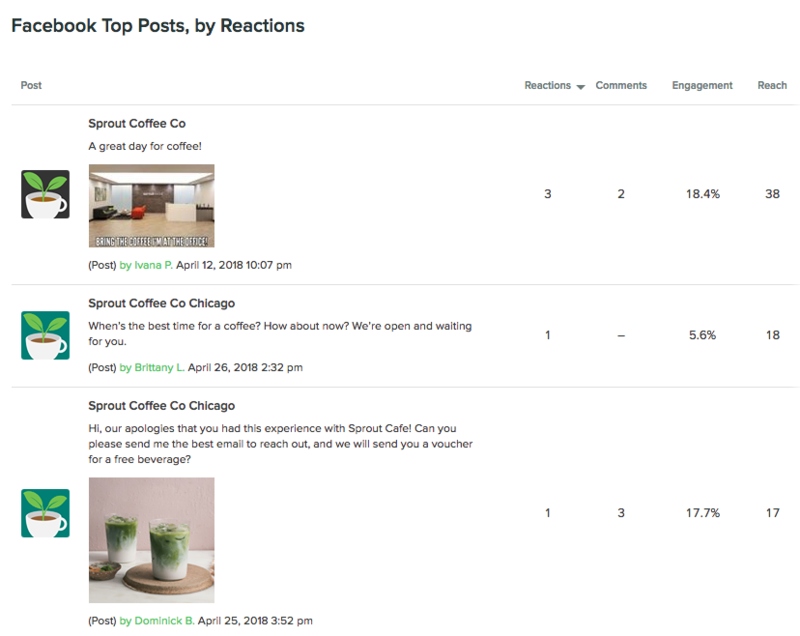 Use an employee advocacy tool like Bambu (made by the Sprout team!) to curate your latest articles, videos and other content for them. Then, all they have to do is log into their dashboard and they can share the content to their personal Facebook page. 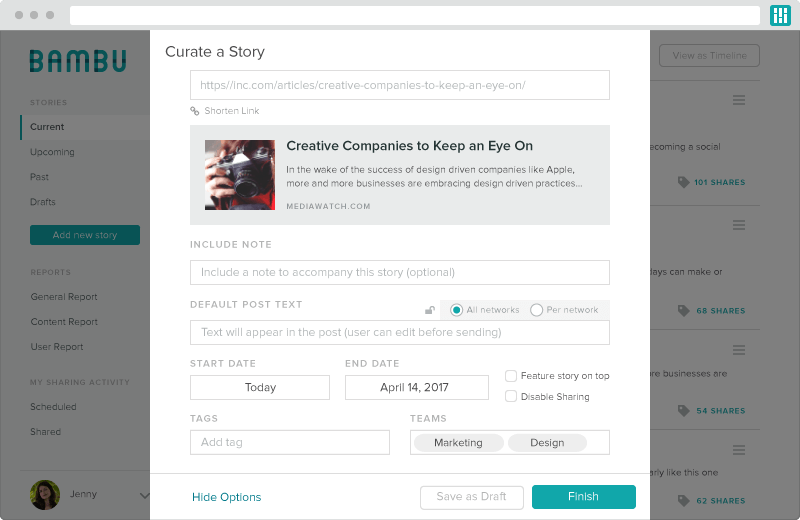 Through Bambu, you can even add suggested text for your team to use in their Facebook post which makes it super simple for them to just find the content they want to share and publish. On top of that, they can share it to Twitter and LinkedIn as well. The best part is employees are ready and willing to share your content. Data shows 70% of people use social media at work. 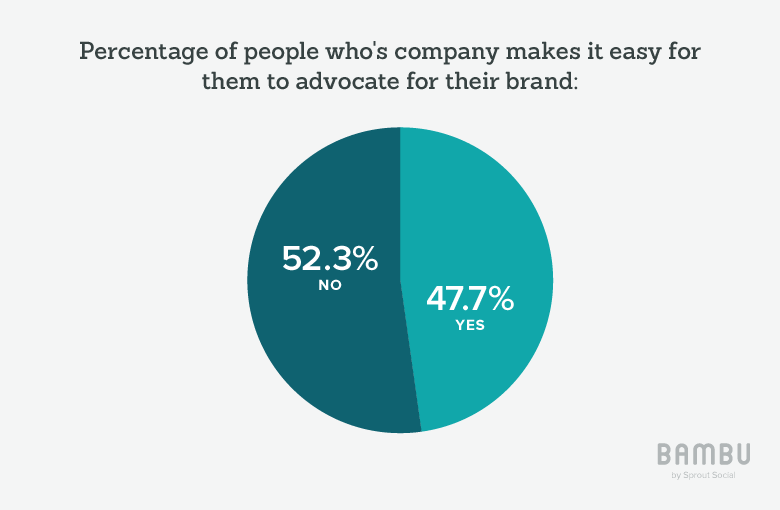 However, 52% of employees feel their marketing teams don’t make it easy for them to advocate for the company on social media. The benefits of advocacy go way beyond just reaching more people. Sure getting impressions is nice, but what you really want is for people to read the articles and engage. 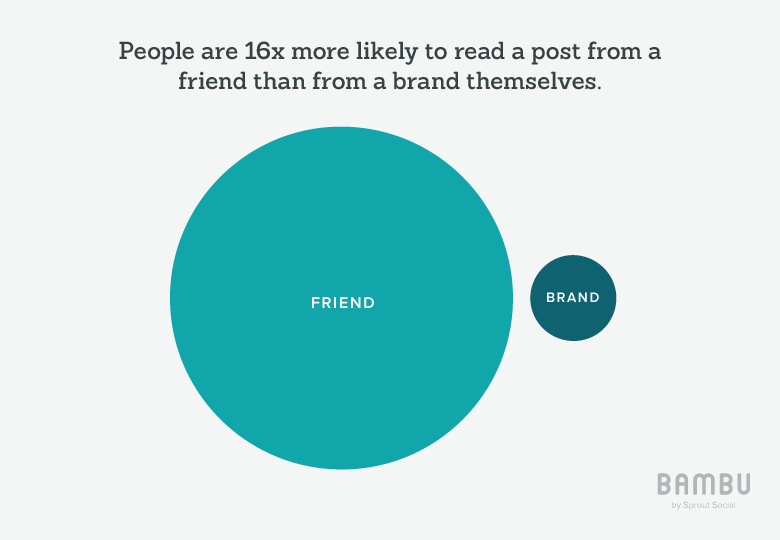 People are 16x more likely to read a post from a friend (i.e. your employees) than from a brand. Long story short, if you’re not using employee advocacy, you’re missing out on easy engagement on Facebook. If you’re interested in learning more, see Bambu in action here. 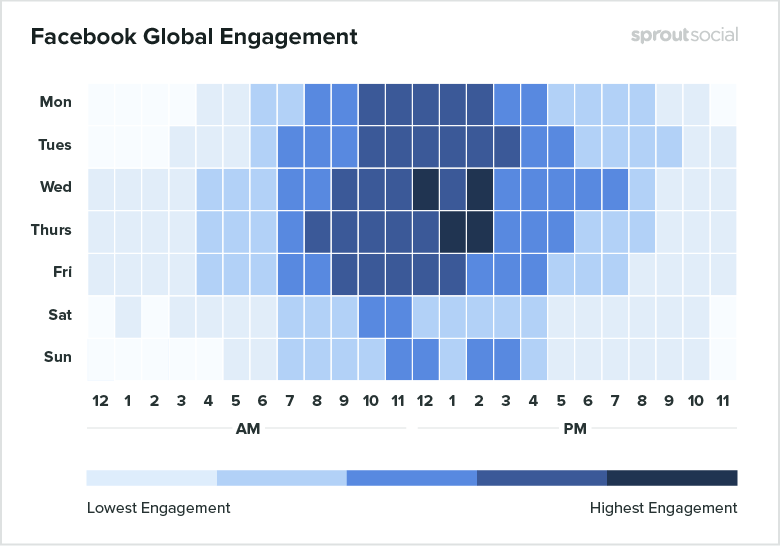 Do You Have a Facebook Engagement Strategy? At the end of the day, what matters most is simply having some sort of Facebook engagement strategy. Period. If you look at the top brands on Facebook, you’ll notice that they’re consistently posting and interacting with followers. On the flip side, dead pages are the ones that simply parrot their own content and make no effort to, well, engage. The good news? You can start implementing these tips into your Facebook strategy ASAP without lifting a finger. We want to hear from you, though. What do you see the best brands on Facebook do to win comments and shares? Let us know in the comments below!